Cavanna Homes are the largest independent house builder in the South West and have been operating since 1923. Today the firm has a multi-million pound turnover, a major building programme of new properties across Devon and the rest of the region, and a well-deserved reputation for constructing the highest quality homes. Cavanna came to us for a completely new design and rebuild of their existing website. They wanted a fresh new look that would put them above their competitors and convert more potential customers to successful buyers of their properties. Their previous website looked outdated and the mobile site was completely separate from the main site, so any devices in between didn’t show the site at its full potential. With website views on mobile/tablet devices now outnumbering desktop computers, it was essential that the new design would look its best on every size device, maximising on what little space is available. We took to the drawing board and came up with a number of potential designs for the new website. While they all took on a different approach, it was very important the designs all focused on high quality imagery. Cavanna build great quality homes so this needed to be reflected in the visuals. There was also a lot of information that needed to be relayed to site visitors. This included the housing developments, house styles and individual plots on every site plan, so this had to be displayed clearly. All of these important factors had to then be positioned and arranged for the best user experience across all devices from small mobile phones to tablets to laptops to widescreen computers. Our agreed design was new, exciting and ticked all of the above boxes. Each Cavanna development has its own individual colour which is used across their branding. We took these colours and tailored the relating houses and plots to their development, giving the site a fun and inviting feel. Pages had to flow, which we solved through animation of individual page elements that would ‘fade in’ as the user scrolled through the page. This is exactly what Cavanna were looking for. While Cavanna’s existing Content Management System (CMS) did the job for what they needed, it was confusing and the level of customisation wasn’t good enough for what they wanted to do. The new CMS needed to be intuitive, user-friendly and quick to update developments, houses and plots. Cavanna gave us a fairly lengthy timescale to complete the project, but as we know from experience this time goes very quickly. The project was complex from the start. Databases had to be created and a number of custom built scripts had to be developed from scratch in order for the site to function as we and Cavanna wanted it to. This website was going to be one of the largest, most complex sites we had done to date but we knew we had the team to do it within the timescale and within budget. Our first job was to figure out how the existing CMS features could be easily transferred to our CMS. How could we duplicate what they had but make it quicker and easier for Cavanna to use? 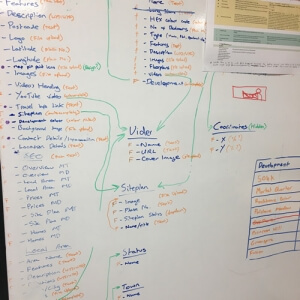 There was a lot of head scratching and whiteboard scribbling! Once we had agreed on a solution, the build could begin. We split the team into two; one to develop the CMS and backend of the site, the other to convert the agreed designs into working, interactive pages. During the build we experienced a number of different challenges. The majority of the project had to be fully customised to match the desired website functionality for site visitors and how Cavanna needed to maintain the content. We used technologies that we’d not used before, which took some additional learning. This included the Google Maps API for the interactive maps and location data including distance measurements for the search functionality, the YouTube API for the Home page main slider, building a fast search feature, and capturing large amounts of data when users register. Our biggest challenge was upgrading the existing interactive site plan within the developments. Cavanna’s existing system allowed them to draw plots on an image of the site plan within the CMS and assign each to a particular house style. When a user viewed the site plan on the website, they could hover over the site plan image and information about that particular plot would appear. However, information was limited, only showing the status of the plot (i.e. Available, Sold, Reserved). Without access to the original system, we had to rewrite this from scratch. Our system exceeded the original and shows far more information to the user, including the price, plot number, a picture of the house style, and the status. For Cavanna, drawing a plot on the site plan within the CMS now takes 1 click rather than several clicks as on the previous site. An entire site plan can now be completed in 10 minutes rather than a few hours! Over the next year we expect this feature alone to save Cavanna hundreds if not thousands of pounds in staff time. With over 27,000 lines of custom typed code and more than 420 hours spent from start to finish, this project was clearly one of our biggest and most challenging projects we have completed to date. But with good project management, organisation, and a highly skilled and enthusiastic team, we know that if you can think it, Blaze can code it! “I would like to take this opportunity say that it has been a pleasure working with both Wall To Wall Sunshine and Blaze Concepts on the rebuild of www.cavannahomes.co.uk and I am very happy with the way in which it has been produced – very professional, friendly and helpful from start to finish – and much more stress free than when we previously updated our website. I am completely happy that we chose WTWS to help manage the whole process and that we chose Blaze to build the site.